Much has changed in the past two years since MIT IDE presented its first Platform Strategies Summit. The idea of interconnected, information-driven networks creating value through open partnerships is no longer a radical vision; it’s becoming mainstream. Even a few years ago, the notion put forth by John Reynolds, Managing Director, Agile Fractal Grid Inc., may have been futuristic thinking. 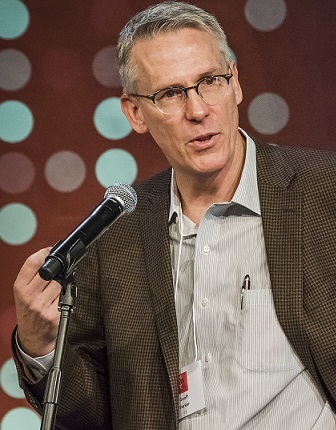 At the July 15 MIT Platform Strategy Summit hosted by the MIT Initiative on the Digital Economy, however, he described a “platform of platforms”/ digital marketplace for operational, analytical and financial applications to be used by members of the National Rural Electric Cooperative Association and their tenants. Reynolds explained details of a planned, shared-infrastructure partnership with 960 rural electric cooperatives that will cover over 75% of the country for decentralized power, communications and computing. The program will offer services from 2.5 million electrical transformers that are “fundamental to the Network-as-a-Service” concept that the Fractal Grid will provide. The planned services will include: E-Commerce products; software-as-a-service; free mobile apps; media hosting; user-generated content and two-sided marketplaces. Clearly, platform business models are rapidly reshaping the structures and conditions of industries from media, energy and telecommunications, to academia, gaming and retail. While upstart businesses—such as Uber, Airbnb and others -- are forging ahead with new business models, traditional industries and organizations also realize that they need to address the challenges and behavior of platform-based markets in any way they can. As Simon Torrence, an advisor at Bearing Point, noted, “Most incumbent enterprises are fundamentally ‘linear’ and pipe-centric” making platforms very new and potentially scary for them. But if platform is the winning business model in the digital economy, he said, “Digital ecosystem management must be the new enterprise discipline” for reaping new opportunities. Nevertheless, Torrence acknowledged that expertise in ecosystem design/management, software engineering and data science is hard to find. Moreover, there are significant organizational barriers that he said require ‘Ninja IT’ and ‘Lean Start Up’ methods to quickly demonstrate value. Emphasis has shifted to recruiting talent to develop platforms and to work in these new environments, according to Janel Garvin, CEO of Evans Data Corp., and for those who can adjust existing strategies to accommodate the new models. This year’s Summit speakers emphasized how widespread and global platform acceptance has become. Keynote speaker, Samuel Palmisano, Chairman of the Center for Global Enterprise, said the companies achieving the largest scale today possess few assets but build an extensible platform ecosystem. “These companies have tremendous leverage and return on capital,” he said. According to a recent global survey of platform enterprises by the Center, the largest platform companies today –Amazon, Facebook, Google--are typically young, public and American. But that is changing. China is the second-largest platform market, in part, because it has barriers of entry for American firms.